On February 8, 2018, Ornellaia celebrated two important anniversaries at a special preview in Milan. The 2015 vintage marked both the tenth edition of the Vendemmia d’Artista project, as well as the 30th anniversary of the first Ornellaia vintage. Commenting on the significance of the 30-year anniversary, he proclaimed that, “Bolgheri has now affirmed itself as the home of real classics.” And as a Bolgheri estate, Ornellaia is entering a new chapter in its existence. Not only are the vines maturing, becoming more balanced, and requiring less effort in the winery, the Ornellaia team also understands its terroir better than ever. 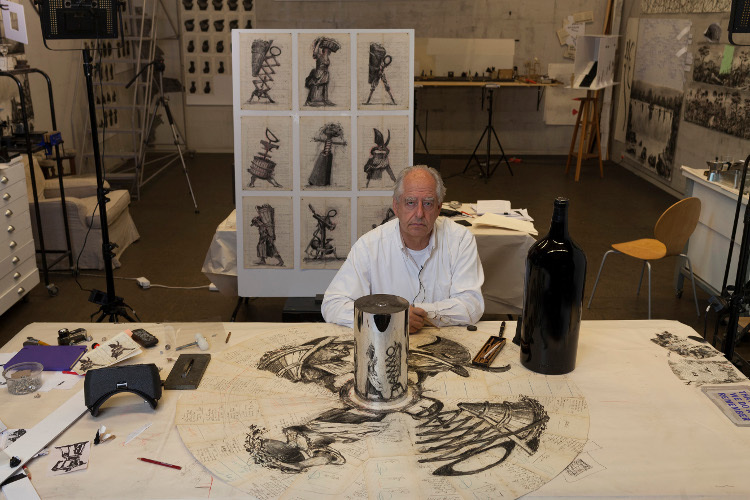 To celebrate the new vintage and interpret its Il Carisma character, Ornellaia commissioned South African artist William Kentridge, who is renowned for his drawings, films, sculptures, animations, and theater performances. Since the start of the Vendemmia d’Artista project the artista have been chosen by Bartolomeo Pietromarchi, Director of MAXXI (Museo Nazionale delle Arti del XXI Secolo in Rome) and Maria Alicata, Artistic Director of Fondazione Baruchello. After consulting Heinz on what defines the vintage, they seek out their artist, inviting him or her to Ornellaia to meet the team and become immersed in the Bolgheri/Ornellaia atmosphere. Kentridge had experienced a Tuscan vintage in his earlier life, and felt inspired to embrace the work involved in producing wine, in particular the vendemmia, the grape harvest. “The aspects of winemaking that combine both manual craft and mechanical processes suggest the transformation of people into machines and machines into workers. This is part of an ongoing series of drawings and other work about human labor. The drawings are done on pages of various antique ledgers and Italian cash books found in flea markets and second-hand shops in the Tuscan area,” explained Kentridge. Pietromarchi pointed out the finer details of the original artwork, which uses anamorphosis—a traditional technique dating back to the Renaissance, whereby a distorted projection or perspective requires the viewer to use special devices or to occupy a specific vantage point to reconstitute the image. In this case the Salamanzar enrobed in steel reflects a 360-degree view of the vendemmia characters, creating dynamic movement as one inspects it from all angles. The artist created the site-specific masterpiece to become a part of Ornellaia’s estate collection. He also customized a limited series of 111 large-format bottles, and designed a special label, an example of which will be found in each case containing six 750ml bottles of 2015 Ornellaia. This special series will be auctioned by Sotheby’s in London on May 23, 2018, and all proceeds will be donated to the Victoria & Albert Museum, which will be hosting the event. Over the past ten years the Vendemmia d’Artista project has donated over €2 million to art foundations and museums around the world. V&A director, Tristram Hunt, announced that the funds from this benefit auction will finance a new Photography Center to open in Fall 2018.